WE HAD THE BOAT! NOW WE HAVE THE MOTOR! Father Rex in old rented boat headed to one of the churches on his three islands. Several months ago, this blog put out the word that the two Filipino priests working on three islands in St. Vincent and the Grenadines were in desperate need of a way to get to their parishes without having to rent a boat or hitchhike on commercial vessels. They had a parishioner with a boat, but no motor. Through the generosity of a friend in Florida. their parishioner has a way to make a living and the priests have a reliable way to get to church. The old boat has a new paint job and our R J MISSION PROJECTS logo on the sides. Here it awaits the arrival of the new motor and steering mechanism. The official blessing and partnership handshake. Percy Forde and Steadmon Forde are the fishermen overseers of the boat motor to be used for their livelihood and at the same time to transport the priests to their islands every Sunday. The sign says, "Thank you Fr. Ron and R J Mission Projects." To that, I would add, RJ Mission Projects thanks our generous donor from Orlando, Florida. and a couple of friends here in Louisville and Jeffersonville. Father Rex and Steadmon Forde take the refurbished boat and new motor out for a test drive. Mr Forde will be able to make a living and Father Rex will be able to get to his island churches. A percentage of the profits from fishing go into a fund to maintain and replace the engine. The first Sunday to take the boat and new motor to the other islands for Mass! Father Rex insisted on getting behind the wheel. HAVE YOU EVER SEEN MONA LISA'S BABY PICTURE? Here I am holding little Mona Lisa, child of the housekeeper at the Bishop's House down in Barbados. She is the happiest, quietest and most content baby I have ever met! She took right to me and seemed fascinated with my white face! Surely, goodness and mercy shall follow me all the days of my life. Every once in a while, I seem to be overcome with a notion that I can’t dismiss. This morning as I was sipping coffee and waiting for someone to show up, I was overwhelmed with the awareness that there is a lot of goodness in the people I know. It is always there, of course, but sometimes I fail to focus on it. When I am able to give it attention, I am always amazed. It occurred to me that I may experience a lot of meanness in a week's time and that meanness may get the lion's share of my attention, but if I pay careful attention I will notice that I also experience some remarkable goodness that is worth savoring as well. 2. The people who constantly affirm me in the writing of this column are lavish in their praise and appreciation. They make me feel like I am making a difference in their lives - something that every priests lives to hear. 4. My family is a constant blessing, a quiet presence that I know is always there should I ever need them. I am proud of the them, they let me know that they are proud of me and neither of us leave that in doubt. 5. The residents of the nursing homes I visit inspire me constantly with the way they handle their situations with courage and grace. They readily show their appreciation for the time I make for them. The staff who cares for them are heroic in giving those residents the care and attention they deserve and need. Their work is not easy, but they seem to see it more as a ministry than a job. They are inspiring to watch. 7 The circle of friends who help me maintain my computer, my blog, my column and my car keep me going and make my ministry possible. In short, most of the people in our lives are unbelievably good to us. They should leave us filled with gratitude, appreciation and pride. We should feel blessed, fortunate and privileged to be the beneficiary of so much acceptance, love and kindness. Nina Clark has a very special diocesan ministry down on the island of Barbados. It was one her mother performed for many years before her. Every Saturday, she cooks lunch for any priest or bishop who wants to stop in - no reservations required. Before we left for the airport on my way back to Louisville, Bishop Jason Gordon took me to her house for lunch. Besides being a successful business woman who rents out her several villas on the island of Bequia, she does this for the bishop and priests of the diocese. She is an outspoken, well educated and all around interesting person to listen to and watch. The day I was there, she served a rich, brown, spicy rice pilaf and fried "flying fish." Yes, they have a local fish that actually flies above the water at times. I had a big glass of lemonade to go with it. Below are some photos of her home - as interesting as she is! Her front gate is decorated with butterflies - something she loves because you see them everywhere. Now she is a woman I would like to get to know! Her house is as colorful as she is! Without warning, the gospel tells us that Simon of Cyrene was "pressed into service" to help Jesus carry his cross. Without much notice, Bishop Gordon got the bright idea that I might as well do a class for his deacon candidates on preaching the morning I was to leave for the airport to come home. He is a hard man to resist, so I said, "OK, I'll do an hour class on preaching." I just happened to have a short paper on the relationship of deacons to the bishop and the priests of the diocese and an insight or two about what kind of preaching a deacon ideally does. I have included it here. I also just happened to have some expanded notes on preaching in POWERPOINT from the retreat I had just finished for him. The night before, I was able to use a section from that presentation and put together a decent class for the deacon candidates for the Diocese of Bridgeport, Barbados. Bishop Gordon has a policy of getting as much mileage as he can out of me even when I am just passing through on my way to St. Vincent and the Grenadines. Doing my thing with the deacon candidates, a seminarian and Sister Cheryl in Barbados. Bishop Gordon taught after I finished. He is wearing one of his new clergy shirts that he wanted and I was able to get from Tonini Church Supply here in Louisville. As long as Moses kept his hands raised up, Israel had the better of the fight. Aaron and Hur supported his hands, one on one side and one on the other, so that his hands remained steady till sunset. I cannot read the story of Aaron and Hur holding up the arms of Moses without thinking about one of the best descriptions of the diaconate and its relationship with the presbyterate I have ever read. It is in Walter Cardinal Kasper's book Leadership in the Church: How Traditional Roles Can Serve the Christian Community Today. One of the great things to come out of Vatican Council II was the restoration of the deaconate. Now various motives were behind this restoration, including a vision of relieving the pressure of a future priest-shortage. The council rejected this idea because the diaconate is an autonomous grade of the sacrament of orders, not a substitute in places where priests were lacking nor one particular form of lay ministry. The council fathers saw the diaconate as vitally necessary to the life of the church and, with the presbyterate, one ordained ministry, of which the episcopacy is the fullness, going back past medieval developments to early church ordination liturgies and patristic theology. The diaconate and the presbyterate have different tasks and denote two different structures, but must collaborate with one another because both participate in the bishop's ministry and both are immediately subordinate to the bishop. The Council saw the diaconate and the presbyterate as graded participation in the bishop’s ministry. The diaconate is not a subordination to the presbyterate. The presbyter and the deacon are subordinate to the bishop directly – his two arms so to speak. The deacon is not an "almost priest,” nor is he one who fills in the gap where no priests are available, nor is he necessarily in a transitional stage on the path to priesthood. The main role of the deacon, as the bishop’s representative, leads, inspires and motivates the whole church to service in collaboration with priests. Deacons do not do service for the church, but make sure the church is doing service. This necessary leadership role does not dispense the laity, the bishop or the priest from their own service tasks. Deacons are charged with promoting the deaconia of the whole church, to inspire, motivate and train others for deaconal service, not to "do it" "for the church." At liturgy, it is the deacon’s responsibility to bring the needs of the community, especially the poor, to the table. It is the deacon who trains and guides volunteers, as well as lay ministers. The deacon is the contact person to governmental services. No matter what he is doing, the deacon’s role is to make sure the church is serving, not to be a “almost priest” or, as I have experienced on occasion, a “dress-up deacon” who likes to wear robes and pectoral crosses bigger than the bishop himself and perform liturgical functions, but could care less about service. Neither priest nor deacon carries out his own ministry. Both help the bishop carry out his ministry. The gradations in the participation in the bishop's ministry thus denote two separate arms, which have different tasks but must collaborate with one another in unity. That unity is symbolized when the bishop has traditionally worn a chasuble, dalmatic and tunic all at once. In one ministry, priests hold up one arm of the bishop and deacons the other. In a real sense, both the diaconate and presbyterate "make the bishop present" in the communities entrusted to them. sneered at him. The soldiers jeered at him. One of the criminals reviled him. Surely, you have heard the expression “God’s ways are not our ways!” It means that God thinks differently from the way we human beings think and God does things differently from the way human beings do them. 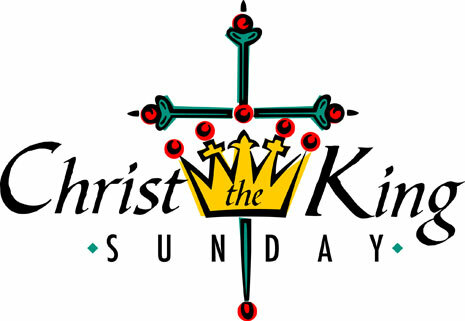 We see the most dramatic example of just how differently God thinks in today’s feast of Christ the King. Christ our King is presented to us, stripped and naked on a cross, dying in agony between two common criminals, spit running down his face, a sarcastic note nailed above his head, a “crown” of thorns mockingly hammered into his skull for all passers-by to laugh at! Now that’s not exactly how we picture royalty! We are used to seeing them powerful, pampered and pompous! Our King is different, very different! “He bore our infirmities. He endured our sufferings. He was pierced for our offenses. He was crushed for our sins. His chastisement made us whole. His stripes healed us.” Without doubt “God’s ways are not our ways!” God does not think the way we think! No wonder most people missed this king. They were looking in the wrong direction. They thought they knew how God would act. They thought he would act as they would act. As one preacher put it years ago, “In the beginning, God created us in his own image and likeness and ever since we have been trying to create God in our image and likeness!” Instead of thinking as God thinks, we try to make God think the way we think. No wonder we experience God as absent, more than present, in our lives! We keep trying to make God reasonable, we keep looking for God among the rich, the beautiful, the self-righteous and the powerful! No wonder Christianity is dead in countries where power, prestige and money are prized, but alive and well and growing in countries where the poor, the powerless and the suffering live. The latter understand how God thinks! The former is still trying to get God to think as they think! The rich and powerful and beautiful and so-called smart people think they can do without God. The poor and powerless know that they need God! One the most common ways we do not think as God thinks is when we think that God is absent when things go wrong and present only when things go right. Looking back over my own life, I can say with confidence that it was during those times that God seemed most absent is when God was actually most active! I could not see it at the time, but it is crystal clear from hindsight! (1) As I look back over my life, especially over a sometimes very painful childhood lived out in the terror of what we would call today, psychological abuse. It was very painful and I would not want to go through it again, but I have come to realize that God was certainly using it to prepare me for helping hundreds of others as a priest. I can say with certainty that that experience, and the triumph over it, has helped my effectiveness as a priest more than any other thing! (2) When I was sent to the home missions right after ordination, I certainly felt at the time that God seemed to have abandoned me. In reality, looking back, God was extremely active at that time in my life. God was preparing me for my life’s work as a preacher, as a "revitalizer" of parishes and as a person sensitive to religious prejudice. Looking back, I have realized over and over again, that that period of my life was preparing me for what I have been doing ever since! (3) When my beloved mother died of breast and brain cancer before my distant abusive father, I felt that God was unfair! I felt that she deserved to have some time of peace, some time to do the things she never got to do! Looking back, I realize that God had a plan even there. Her death first gave me an opportunity to be reconciled with my father, an opportunity that I took. If God had done things the way I thought he should do them, I would not have had that chance and I would still be carrying the anger and hate that I carried most of my young life! It was an unexpected gift for which I am truly thankful! On this Feast of Christ the King, a feast in honor of the king that is the reverse of how we think of kings, we are challenged to think differently about God. It’s message is simple: God’s ways are not our ways, it is precisely when we feel God most absent, is when God is most present! So I say to all of you who have things going on in your life that you don’t like, things that make you feel that God is absent, just wait! Trust God! I believe that you will someday realize that, even in times of loss and tragedy, God is very active. Scriptures tell the story in a million ways: God’s ways are not our ways! Contrary to popular opinion, breakdown is a sure sign of a breakthrough, there is a crown on the other side of every cross, resurrection on the other side of death! That heart attack may just wake you up to what’s really important! That relationship breakup may be the best thing that ever happened to you! That firing may just take you to the best job you ever had! That unexpected death may bring you closer to others! Ugly ducklings today may just turn out to be swans tomorrow! Getting what you want may turn out to be your worst nightmare! That child that disappointed you most may just turn out to be the child that makes you most proud! That feeling of God being absent, may be the beginning of feeling closer to God than ever! Never underestimate the value of a so-called tragedy! God’s ways are not our ways!